GeO Tislevoll has won the International Bridge Press Association (IBPA)award for the best defended hand of 2018. This has just been presented to him at a ceremony in Sanya, China on October 25th. GeO is a current New Zealand Open international and has lived in Auckland for many years, though coming originally from Trondheim in Norway. IBPA and the Hainan Bridge Association recently signed a long-term cooperative agreement. 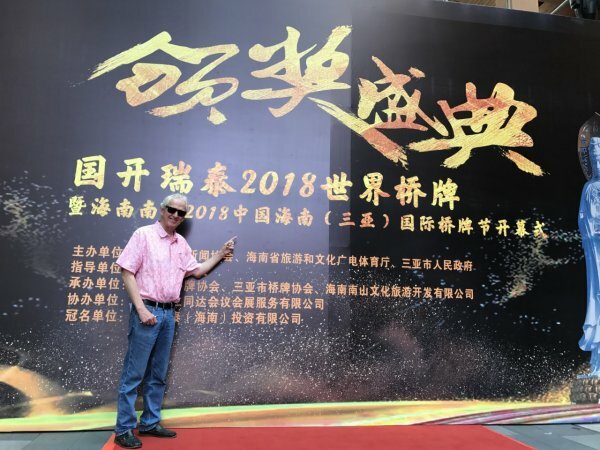 According to the agreement, Sanya will be the host city for these awards and an accompanying Bridge Festival for next six World Bridge Awards Ceremonies, through to 2023. The annual World Bridge Awards Ceremony are held at the opening day of the China Hainan (Sanya) Bridge Festival.It was covered on Chinese television. 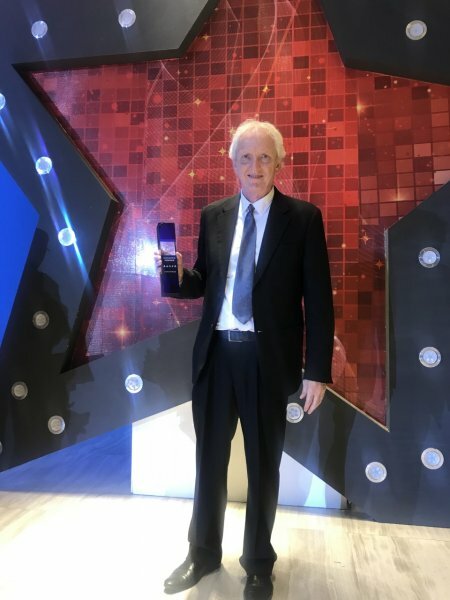 The 2018 World Bridge Awards Ceremony featured a number of awards, including Personality of The Year, Best Defence of The Year, and Individual Youth Player of The Year. Another Norwegian, Boye Brogelund, won the Award for the Best Played Hand. Youth Player of the Year was Australia's Matt Smith. Top American, Bob Hamman, won the Personality of the Year Award. 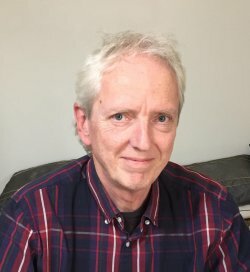 The hand which won the award for GeO was very well written by Liam Milne, a Wellingtonian, winner of this year’s New Zealand Pairs and who now lives in Sydney. I hope you enjoy the article which follows and which takes the readers into the mind of a top bridge player. "From New Zealand’s North Island Teams (2017), how do you handle this hand in third seat with no one vulnerable? On some hands it would be right to make a light third-seat opening of 1♠, but with a seven-card suit it is normal to bump the auction up and pre-empt the opponents. You open 3♠, and South overcalls 4♥, passed out. Which spade do you play at trick 1? It won’t often be right for partner to play another spade. So, we want to let partner know which minor suit to switch to. We prefer clubs to diamonds. So let’s say we play the 2, suit preference for clubs. Partner obediently switches to the A (we might have had a singleton, after all), followed by another club to our king. Declarer follows with the ♣ 8 and ♣ 9. Partner’s second club was the ♣ 5, consistent with an original holding of two or four cards in the suit. With three tricks in the bag, how do we beat this contract? Let’s walk through what we know, followed by what we must assume. Partner is a passed hand and has already shown up with two aces. They can’t hold the A as well, and if they have a natural trump trick, declarer will go down whatever we play. With four hearts to the ten, for example, partner doesn’t need our help to take a trick. So, assume declarer's hearts are fairly strong. How many clubs do partner and declarer have? It looks like partner has four clubs and declarer has two, but it's possible that partner is the one with the doubleton. If so, we'll have to hope partner turns up with a trump trick. We can probably assume declarer has no more clubs left. What about the spade suit? With four spades, partner would definitely have bid 4♠, and with three they would often have pushed on to 4♠ knowing that there appears to be a ten-card fit. It is most likely that declarer has three or more spades given that partner did not compete to 4♠. Besides, if declarer has only one spade left, it's hard to see what we can do to win another trick. Given the lack of prospects in the minors, is there any chance of promoting a trump trick for partner? Yes: if partner has no spades left, we can simply play a spade. Partner will be able to ruff in front of dummy with a heart higher than the 5. But is there any real rush to do this? Giving partner a singleton spade would mean declarer started with four of them, and declarer’s shape will therefore be 4=6=1=2 unless declarer has overcalled on a five-card heart suit. This seems unlikely as it gives partner two aces and five hearts. Yet they failed to double 4♥. If declarer has 4=6=1=2 shape, we can afford to play anything. Declarer can’t run the diamonds as they are blocked and will have to play spades themselves. Partner can ruff in front of dummy and return a trump, and we will make two more spades later. If declarer has four spades, they are going down. How do we beat the contract if declarer has only three spades? A trump shift will appeal to many given dummy’s spade shortness and lack of long trumps. Projecting the play, however, this can’t really be working. Declarer will win the trump shift then either draw trumps and run the diamonds, or ruff a spade over to dummy and play off dummy’s myriad minor suit winners. Denying declarer two ruffs doesn't do anything as they were never going to take two ruffs. Recap: Declarer has the A. If partner has a trump trick, declarer is going down. So, let’s assume that declarer’s hearts are solid. And we can see that declarer likely has exactly three spades and two clubs. Count: What is declarer’s shape? Looks like 3=?=?=2. If declarer has two or more diamonds or another low club to get back to dummy, our play at this point isn’t going to matter. Let’s focus on declarer holding the bare A and that the diamonds are blocked. On the crucial layouts, therefore, declarer most likely has 3=7=1=2 shape. Their key problem is where to park the two spade losers. This shape is one of the many layouts where a trump shift does nothing good for us, and likewise a diamond shift won’t work. Declarer will win it, take one round of trumps and then play as if we had switched to trumps. Back to the drawing board. What’s the winning play? Assuming our play matters, neither a diamond nor a heart will do anything good. It has to be a spade, counter-intuitively giving declarer a ruff in dummy immediately. Why might this work? Well, we’ve assumed the diamonds are blocked. If we make declarer ruff in dummy before the A is out of the way, this will cause declarer problems. And we could never stop declarer from taking one ruff, even if we had switched to hearts. Which spade – king or low? If partner has the J, both plays are the same. So, assume declarer started with three spades to the jack. Playing the king, ruffed in the dummy, sets up declarer’s jack. They will draw trumps and claim, still assuming the trumps are solid. On the surface, a low spade doesn’t seem to do much better as it lets declarer win the jack right now, and we haven't forced dummy to ruff. Time to make a decision. What’s your play? After the A, the A and a club to the king, East plays a spade. If that spade is the king, declarer ruffs in dummy, draws trumps and claims ten tricks. What about a low spade? Declarer wins the jack (or the eight, if they prefer! ), but this unwanted gift comes too early to be useful. If declarer draws trumps, they are left with a losing spade. If declarer wins in hand and tries to ruff their last spade, West can ruff in front of dummy to beat the contract. The best declarer can do is ruff their (currently winning) spade in dummy and try a top club, but East still has a trump and can ruff the winner away. Declarer can never use any of dummy’s diamond winners because of the blocked position that we had to assume existed. A spade at trick four works by knocking out dummy’s entry (the spade ruff) before the A is unblocked. The difference between the K and a low one is that the king gives declarer two tricks (a ruff in dummy and later the J, now high) while a low spade only gives declarer one trick. Declarer can’t take their cheap spade trick as well as their ruff – the spade ruff is only available on the second round of the suit, not the third. The problem of the third spade never gets solved. It wasn’t necessary to work out exactly how a low spade was going to work. All that needed to be worked out was that neither a trump nor a diamond switch was going to do anything good for the defence, and that between the two options in the spade suit, the king was going to lead to the contract making in the assumed crucial layout. With all other options ruled out, it was clear to play a low spade as the only chance. This deal was sent to me by GeO (Geir-Olav) Tislevoll who found the winning play at the table. Many experienced players would feel the instinctive appeal of a trump switch at trick four, but it took an expert to look into the likely consequences (and then try to find something better). This hand was appealing, not only because of the nice play and unusual theme, but also because of the situation declarer found themselves in at the end. They have been given a cheap trick by the opponents. There are seven running hearts and an ace still in hand plus another seven winners in the dummy. Yet there is no way to make ten tricks!" The defence took the first three tricks. With that "unwanted gift", the declarer had approximately 15 winners between their two hands but was unable to take all of the last nine tricks.